Well, that's the 2006 show season over and done, with only indoor shows such as the VBOA Autojumble and the Historic Motorsport show over winter to last until next summer. As usual, stand space at this show is pretty much down to individual choice and what's available at the time, so we had an unofficial DSG stand which started the day with Firenzas from myself and Mark Aratoon and Dietmar Wood's Viva estate, and ended up with a third Firenza from Barry Carter. We managed to get all three Firenzas lined up together and it was quite a sight. 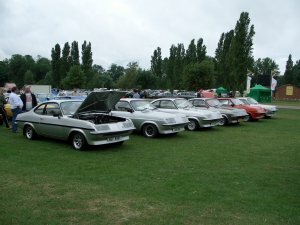 The Viva Drivers Club was also present, with a separate stand near to one of the Opel clubs. A brace of Vivas from nearby Nantwich were in the individual entries area on the other side of the field. All in all, a good showing for the HC range. The weather wasn't too bad considering the show is quite late in the year, though it did turn quite wet towards later afternoon, drying off again shortly after for the journey home. A joint stand with the Viva Drivers Club saw a great turnout of twelve cars on the Saturday, quite remarkable in that it rained almost all day. Much of the autojumble was covered over, and a fair number of clubs and trade stands didn't turn up at all. Sunday was a much better day, and in fact the poor weather the day before did us a favour as we were able to put the DSG cars on an abandoned plot on the other side of the walkway, giving us cars on both sides. Phil Moorcroft and Andy Baum visited for the first time in Chevette HS and Chevette estate respectively, and HPFs from myself and Mark Aratoon along with Dietmar Wood's Viva estate made up the rest of the stand. It was nice to see some different cars for a change, and hopefully we'll see them again, along with other northern members, for future shows. A nice local show, the Nantwich festival is growing every year although a clash with the steam engine rally at nearby Astle Park kept the numbers down a little. 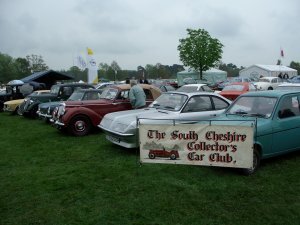 As usual with these shows, turnout was much better on Sunday than on Saturday, with a number of cars from "Clwyd Practical Classics" club making an appearance. The centre of the showground was dominated by a local American car club, and a car fitted with trick suspension kept visitors entertained. Hopefully we'll see this show grow over the next few years, as it has a nice spacious venue and no special entry requirements. A damp start to the day, but a good turnout of cars on the DSG stand included Simon Parker's replica of "Silver Bullet", Dave Wheatley's immaculate racing Firenza, and a selection of Firenzas and Chevettes. Only one real Sportshatch made it, perhaps there will be more next year. The autojumble was a little disappointing, but I did manage to get hold of a spare pair of rear quarter glasses for my Sportshatch, which amazingly managed to get all the way home without breaking. 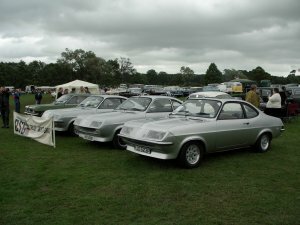 The unofficial theme of the show was prototypes and one-offs, and a fine display had "Silver Bullet", "Silver Aero" and the "Black Magic" Chevette. My car has a little better feel to it now, having replaced the rear bushes with new polyurethane ones sourced from the DSG spares tent at last years Billing show. Well, what a weekend. The sun came out and stayed out all weekend, and there were several red faces at the end of saturday, along with red necks, red legs and red shoulders. 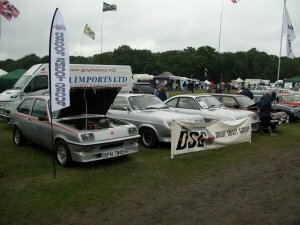 The DSG had a joint stand with the recently-formed Viva Drivers Club, and Sunday saw a very packed stand with three HPFs helping to make up a total of around fifteen cars. Luckily the chaps next door on the Dolomite Owners Club stand were happy to let us spread out a little as they had fewer cars on show. Another pleasant show at Cholmondeley Castle, though light rain started just after lunch and didn't really stop until we left. A few new stalls at the autojumble made a pleasant change, as it gets a little boring with the same stuff over and over again. Paul from Wrexham told us of a Sportshatch he had bought, sadly it is beyond salvation but the parts are already being used to bring other hatches back to the road. The forecast rain didn't materialise for this, my first show of 2006. The car wasn't running all that well, which turned out to be nothing more complicated than a bad spark plug. One of the features of the Sandbach show is the cavalcade, and although I don't take my car on it, many others do. This years show coincided with the 150th anniversary of the Foden truck manufacturer, so there were more trucks than usual at the show and in the procession. Sadly it's also the year that Foden went into administration. Still, a good start to the show season.